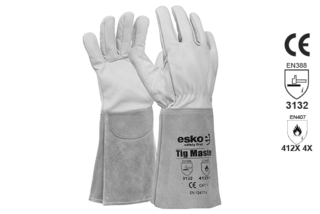 Experience soft feel of premium deerskin leather in the ProChoice Tigga� TIG welding gloves. Designed with precision TIG welding in mind. Deerskin hand cover permits sensitive touch and dexterity, while the extended, chrome leather cuff gives increased forearm protection. Premium Goatskin Welders with Kevlar Fine-Lining. 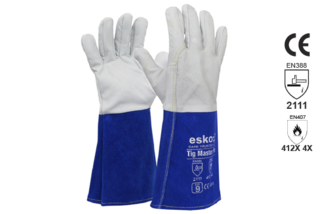 Supple goatskin leather makes this glove durable and tough, without compromising on comfort and dexterity. Cut resistant, heat resistant Kevlar� lining. Pyromate Pigsplit Welder. Length 40cm. Kevlar stitched, High quality cow split leather for comfort and economy. -Size: One size fits all. 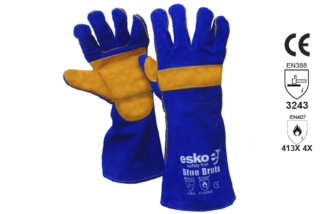 Blue/Gold welders glove, palm & knuckle bar, kevlar stitched, lined/welted, 406mm long, premium quality. Professional Tig Welding Glove, Premium Leather with Blue Leather Extended Cuff, Kevlar Stitched, Size: 9,10. Premium grade Kevlar stitched Tig welders glove. -Quality soft and dexterous goatskin leather. -Crafted for enhanced dexterity, comfort & feel. 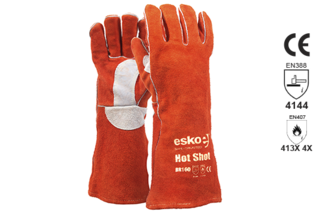 Red/rust welders glove, Kevlar stitched, lined/welted, 406mm long reinforced palm, premium quality. 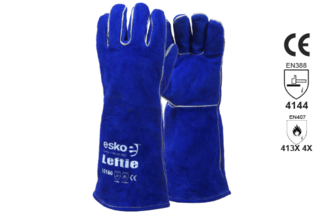 Left hand pair blue welders gloves, premium quality, lined/welted 406mm.